Michael Mahan at Worth Avenue Yachts tells me that he and Simon Gibson have taken over the central listing for the 57.9m motor yacht Mi Sueño. ABS classed and MCA compliant, Mi Sueño was designed with a transatlantic range, but also has a draught suitable for cruising the Bahamas and US East Coast. She has a maximum speed of 20 knots and a range of 4,000 nautical miles at 10 knots. 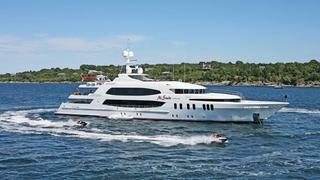 Currently in St Maarten, Mi Sueño is asking $39.95 million.